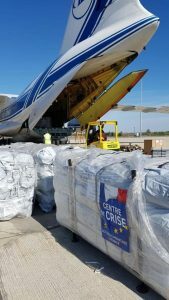 The flight was performed by one of Volga-Dnepr Airlines’ modernised IL-76TD-90VD freighters from Châlon Vatry Airport in France to the Indonesian city of Balikpapan on request of the Crisis Centre of the French Ministry of Foreign Affairs. Following their arrival in Indonesia, the generators and water purification system – weighing 29 tons in total – will be transported to the worst-affected areas. The equipment will provide much-needed electricity and clean water for the local population. Since the 1990s, Volga-Dnepr Airlines has been responding to humanitarian and relief calls all over the world. Its experienced and qualified specialists have been able to provide timely and much-needed support to the victims of some of the most devastating disasters of the 21st century, including hurricanes Katrina and Irma in the USA, the Chaiten volcano eruption in Chile, earthquakes in Haiti, Turkey, India, Japan and China and other numerous natural catastrophes around the world. Volga-Dnepr’s team understands that time matters in these particular situations and provides the most effective logistics solutions for all types of cargo, from heavy machinery and helicopters for rescue operations to mobile hospitals, large volumes of water purification equipment, tents, and temperature-sensitive goods such as food supplies and pharmaceuticals. “Our unique fleet of 12 giant An-124-100 freighters and five modernized Il-76TD-90VD give us numerous possibilities while organizing charters for humanitarian missions. These aircraft are self-sufficient in remote locations or where local infrastructure has been damaged, provide both nose and rear ramp loading capabilities, and meet all ICAO requirements for international flight operations in compliance with the latest noise and emissions standards. With its expertise and experience in operating charter flights, Volga-Dnepr is always among the first responders to support victims of natural disasters, allowing emergency relief management agencies and governmental organisations all over the world to deliver critically-needed cargo and supplies in what is always a significant race against time,” highlighted Konstantin Vekshin, Executive President Cargo Charter Operations, Volga-Dnepr.